Made some progress thanks to a Lenten resolution. See a rocky-beach screen capture. Out of all my projects the one I’m most intent on completing right now is The Tree of Knowledge. I’m truly making an effort to finish it this year, by August if possible. That month marks the 10-year anniversary of Knytt Stories, the foundation upon which TToK rests. Though it may have been an odd resolution, I made working on it every day part of my Lenten practice. Now that Easter has arrived, I figured I’d let the world know that this project is not dead. It is very much alive. I’ve been restricting myself from posting too much about this project. Chiefly, I don’t want the people who have been following since the beginning to be familiar with every location before I publish the finished product. Another reason is I’ve been working (and mostly not working) on this for a shamefully long period of time. I seriously don’t want to create any hype until it’s nearly complete. 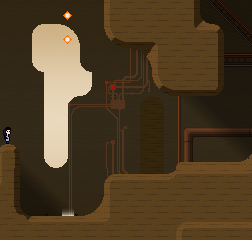 Tim McDowell launches himself into making a game about a little robot and a strange alien. Since early Summer I’ve been working on a new project. The concept is to create a new game based on the Knytt Stories source which will use the Knytt Stories level editor for design. Anyone will be able to create and share their own content for the game. Though this approach gives me a good head-start in programming, there’s still plenty of programming to do, not to mention the gargantuan task of creating all the graphics and sounds. Thankfully, I am receiving help with music. To make Hidden Star stand in its own right, I’ve reworked many of the key elements of game-play. The first notable change is the view. The camera tracks the player through large zones while the viewing area has shrunk. This has allowed the addition of parallax scrolling backgrounds. The smaller view necessitated cutting back on the player character’s speed, which brings me to the second big difference: platforming mechanics. There are two playable characters each with their own move sets. The fast little robot can’t climb sheer walls; but he can duck, crawl, and grab ledges. The large and strange alien can climb some surfaces, glide through the air, and swim through the water. Additionally each character has special ways they can interact with the environment, and receives different reactions from its inhabitants. The video below has the robot showing off his moves to some uninterested humanoids. I’ve a long way to go in this endeavor, but I think I’ve made a good start of it. A pit stop between adventures becomes a bit of an adventure itself. Follow Juni as she traverses a swamp in search of refreshment. 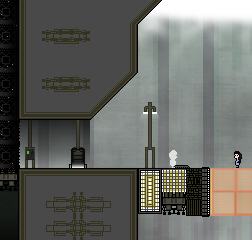 A long time ago I made several Knytt Stories tilesets for an aspiring level designer. 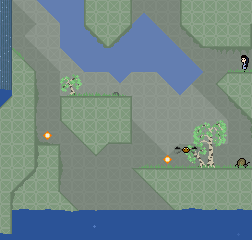 One of these was a swamp based on Fredrik Andersson’s Thin Forest tileset. Through the Swamp was conceived as a nice way of releasing these graphics. And though it certainly is that, Through the Swamp has managed to become a charming level that can stand proudly among my best work. It’s available in 2 versions. The mono version is for those with low bandwidth. Requires Knytt Stories and Knytt Stories + to play.